This article was originally published on Friday, 1 February 2019 at 8:49 A.M. SGT; it has since been updated. 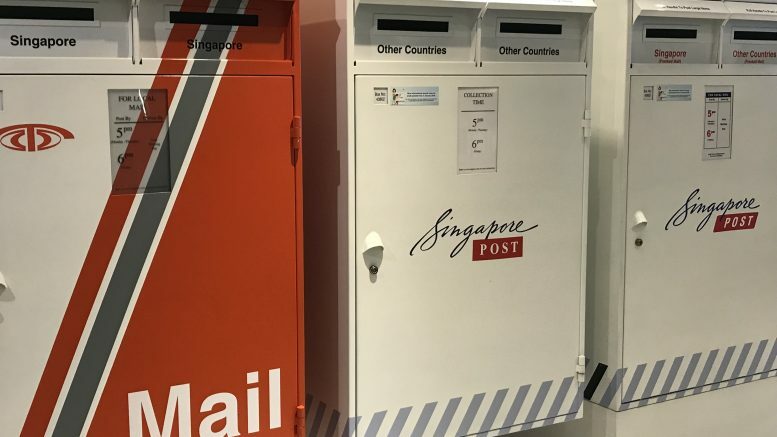 Profit on operating activities dropped 8.5 percent on-year to S$42.23 million, with higher contributions from the post & parcel, logistics and property segments largely offset by losses at the U.S. e-commerce business, SingPost said. Paul Coutts, CEO of SingPost, said it was an exceptional quarter, with strong performance outside the “challenging” U.S. segment. “We continue to advance our integration and cost transformation programs to enhance operational synergies and improve profitability amid intense competition in e-commerce logistics,” he said. The e-commerce segment posted a wider loss on operating activities of S$13.4 million for the quarter, compared with a loss of S$4.5 million in the year-ago quarter, SingPost said. That was even as revenue rose 8.7 percent on-year in the quarter to S$82.5 million, it said. The company said there was a risk of impairments in the carrying value of the U.S. businesses. The post and parcel segment posted a 10 percent on-year increase in profit on operating activities to S$47.6 million, while the logistics segment reported a 67.4 percent on-year jump in profit on operating activities to S$1.8 million for the quarter. Post and parcel saw an increase in both domestic and international e-commerce deliveries during the peak season, with international mail getting a boost from Alibaba Group, via 4PX, for the November Double Eleven, or Singles Day, event. In the logistics segment, the increased earnings were largely on lower losses at Quantium Solutions, amid an ongoing review of unfavorable customer contracts, SingPost said. It noted that the exit of some unprofitable customers dented revenue at the Quantium division. The property segment reported an 18.2 percent on-year increase in profit on operating activities to S$13.9 million for the quarter on rental income from the SingPost Centre mall, which began operations in October 2017, it said. The mall’s committed occupancy was at 98.5 percent at end-December, up from 85.9 percent a year earlier, it said. Revenue for the quarter ended 31 December increased 7.6 percent on-year to S$441.38 million as all business segments posted stronger contributions during the global e-commerce peak season, it said in a filing to SGX before the market open on Friday. The dividend for the quarter was 0.5 Singapore cent, unchanged from the year-ago quarter, it said. In September, SingPost’s associated company Shenzhen 4PX Information and Technology agreed to issue new shares to existing shareholder, Alibaba-tied Zhejiang Cainiao Supply Chain Management, diluting the Singapore company’s interest to 19.75 percent from 30.52 percent. 4PX is a cross-border e-commerce logistics service provider based in Shenzhen, China.